In this chapter we describe resources included in TkZinc widget. This include bitmaps sets (used as symbols for some items or used as stipples), Perl modules goodies and TkZinc simple demonstrations. TkZinc creates two sets of bitmaps. The first set contains symbols for ATC tracks position, waypoints position and maps symbols. These bitmaps are named AtcSymbol1 to AtcSymbol22. 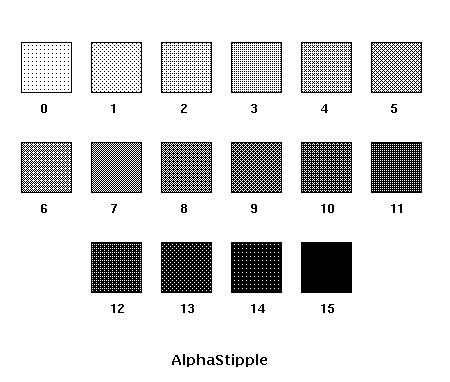 The second set provides stipples that can be used to implement transparency, they are named AlphaStipple0 to AlphaStipple15, AlphaStipple0 being the most transparent. TkZinc package includes two tools for helping you debugging your Perl/Tk scripts or tracking some nasty segfault which should never occure since TkZinc is (almost) totally bugfree. Starting at version 3.2.4 of TkZinc small applications are included as demos. They are all accessible through an application called zinc-demos. These numerous (about 30) tiny demos are useful for newcomers and as starting points for developing real applications. They consists in toy applications, graphically advanced examples or even a TkZinc port of TkTetris from Slaven Rezic. The Tk::Zinc::Graphics Perl module implements many high level functions for building high quality graphic objects with TkZinc. Please read the man page for more details: man Tk::Zinc::Graphics, french version only currently. Any volontear to translate it in English? NB: There is also a tcl version of this module. The Tk::Zinc::Text Perl module implements bindings for text input ’a la emacs’. It works for text item or for text fields of track, waypoint or tabular items. The item which requires text input must just be tagged with the ’text’ tag. The C function AddItemClass provided with the source code of TkZinc, can be used to extent the default set of items in TkZinc in an additionnal dynamic library. The AddItemClass C function is extensively used for implementing the core item set. So please refer to the source code for examples or send email for more information on precise problems. We will try to further document this feature in the future. In the course of the development of IntuiKit, IntuiLab developed a C++ API to TkZinc. This wrapper gives access to functions of TkZinc for opening/closing of a Tkzinc window, creating/destroying items, using colour gradients, events, access to the mainloop... directly in C++ by hiding the use of Tk. This source code (as well as samples and tests) are distributed with TkZinc. IntuiLab choose the same licence than TkZinc, ie LGPL. The C++ API does not fully cover all TkZinc functions, but most of them can be easily extended (e.g. the access of some ATC items currently not wrapped such as track, waypoint, tabular...). The C++ api is fully documented and have been largely tested by IntuiLab for its own need. IntuiLab hopes this wrapper will be useful to the TkZinc community.